Learn about strategies and plants for the most difficult shade conditions. Basic information on the different types of shade you might encounter in your garden has already been covered in the article Shade - The Good, The Bad and The Ugly. In this article, we will cover strategies for making the most out of "ugly" shade conditions. We previously defined "ugly" shade in two ways. First, as areas in your garden that are not only shaded, but are dark,- which is the most difficult type of shade to garden in. These areas get no direct sun, not even dappled sunlight. These spots are usually created by walls or fences, often combined with trees. The second definition is an area where there are shallow rooted trees, such as maple, birch and beech. Shallow rooted trees have roots very near the surface of the soil - practically on top of the soil. You can find more information on "bad" shade in this article. "Ugly" shade has a rather limited plant pallette. Only the toughest plants can tolerate the harsh conditions found in "ugly" shade. The plants used in "ugly" shade are primarily foliage plants. Here are the best options for the most difficult shade conditions. 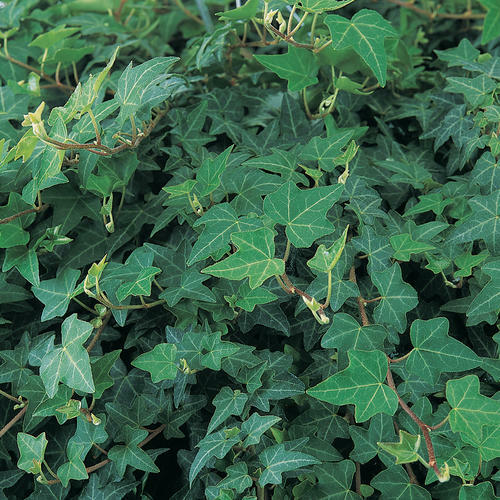 When it comes to tough conditions it is hard to beat English ivy, (Hedera helix.) English ivy is tough, drought tolerant, shade tolerant and hardy to zone 5. It comes in a variety of foliage shapes and colors including shades of green, cream and yellow. In some areas English ivy can become invasive, so before planting check the invasive species list for your area. In some states, it is banned all together. Another plant that will tolerate "ugly" shade conditions is Aspidistra also known as cast iron plant. You may be familiar with it from the houseplant section in your garden center. There are several species available and they are usually only hardy to zone 7 or 8, but could be good in a planter and then overwintered indoors. To see the best selection of cast iron plants, you may need to search for on-line sources. Liriope (Lilyturf) is a grass-like plant that comes with green, green and white variegated or green and yellow variegated foliage. It does bloom, but the main attraction is the foliage. It is a tough little plant and will spread nicely. It is hardy to zone 5 or 6, depending on the specific variety. Ferns, especially Lady ferns (Athyrium felix-femina), are also a good choice. Lady ferns are hardy in zones 4- 8. Ajuga (Bugleweed) is another good choice. Ajuga is a groundcover whose foliage can vary from green to purple to burgundy tones. It is a very tough plant, is hardy to zone 4 and will sport blue flowers in spring and early summer. Ajuga is one of my favorite tough plants. Brunnera, especially the variety 'Jack Frost', is also a good choice. The foliage is green and silver, it is hardy to zone 3 and sports true blue blossoms in spring. Another plant that will tolerate bad shade while blooming is Lily-of-the-Valley (Convallaria.) It is extremely hardy, zone 2, and sports fragrant, white, bell-shaped flowers in mid to late spring. Lily-of-the-Valley can also be a bit aggressive. Some other plants to use are Asarum (Wild Ginger, hardy to zone 4), Pachysandra (hardy to zone 5), Aucuba japonica (hardy to zone 7), Mahonia aquifolium (Oregon Grape, hardy to zone 5), Epimedium (Barrenwort, hardy to zone 4 or 5 - check the tag for specifics) and Bergenia (hardy to zone 4). Strategies for dealing with both kinds of "ugly" shade will have some overlap, but there will also be differences. We will deal with the two different types of "ugly" shade separately. The number one thing you can do to improve a dark area is to try and find ways to increase the amount of light the area receives. However, many, if not most, dark areas are created from solid structures (house, fences, walls, etc.) - many times combined with trees. If your solid structure is a decorative wall or fence, you could improve the light situation in your dark area by switching to a fence that has open spaces. Picket and wrought iron fences, or any other fence that isn't solid, will allow more light into the area. Removing the structure completely would also improve the amount of light the area receives. Remember, you don't have to be adding direct sun to improve the light situation, just allowing more indirect light to come into the area will help. This strategy does compromise the amount of privacy you will have in your space. You will have to decide for yourself if the loss of privacy is worth the increased light and thus increased plant palette that will result. For most people, these solid structures are permanent parts of their home or landscape and changing or removing them is not an option. If your dark shade spot is due, partly or completely, to trees blocking the light, judicial pruning of the trees can be a huge help. This is often referred to as limbing up. Limbing up isremoving lower growing branches to raise the canopy. Raising the canopy will allow more light to filter to the ground. My husband has done this to all of our trees and it is one of the best things we've ever done for our garden. If you decide to trim or limb up your trees, I would highly suggest having a professional certified arborist do the job. Limbing up can include removing some pretty major limbs of trees. This can be dangerous, especially if you are not used to working with the power tools necessary for the job It is also easy to accidentally injure your trees to the point where they do not recover. A certified arborist can not only safely use the power tools, but will also know how to prune the trees without harming them. This is probably not a job you want to trust to someone that isn't truly knowledgeable and is one area where looking for the cheapest option may not be the best decision. While the plant palette for this type of shade is rather limited, that doesn't mean you can't use it as an element to create a garden space you can enjoy. Deep shade does have the benefit of being a great escape from the heat of summer. 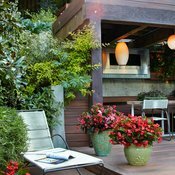 You might consider combining plants in the landscape and in containers with a seating area to create a summer getaway in your yard. The first thing I would contemplate for this type of space is some kind of seating. A bench, patio table and chairs, chaise lounge or other piece of furniture would give you a reason to spend time in your deep shade space. A path to the seating area would be a another nice touch. The path can be as fancy as stone or brick or as simple as a good layer of mulch or gravel. The next thing I would add is a water feature. There are few things more soothing than the sound of running water. Fountains don't have to be large and expensive, although they can be. 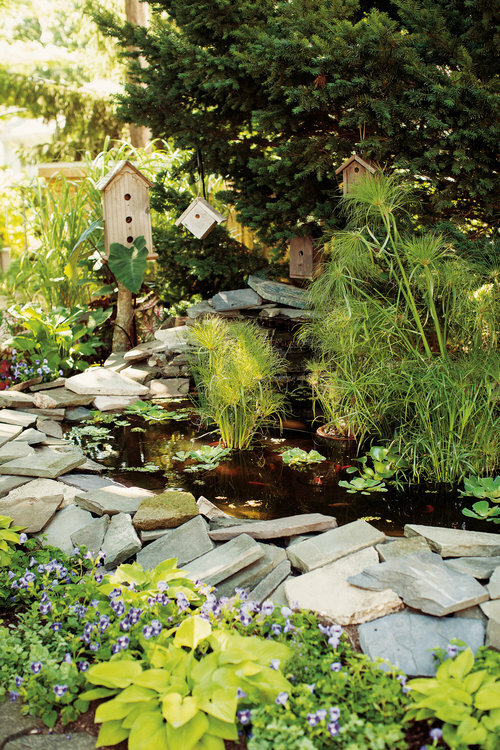 You could also go all out and install a pond. A water element is not only soothing for people, it should be an attractant for birds and other wildlife. Beyond seating, paths and water features, start thinking about adding some color. The plants you are using will rely mostly on foliage for interest. You can add color to your space with statuary, bird baths, colorful containers (either planted or simply used as an accent), bright accent pieces to hang on the solid structures and other pieces of garden art. Hanging a mirror is another way to add interest to your space. Don't think of garden art as applyling only to things you can sit on the ground or hang on a fence. Look up and use those trees that are shading your spot as another opportunity to add color. There are many options for items you can hang in and from the trees to add color. You might also consider using bright colors for your seating area. A pair of Adirondack chairs painted a bright color would give you both seating and color. This brings us to paint. Don't be afraid of using paint to liven up your dark shade corner. While painting part of your home a bright color is probably out of the question, painting your fence might not be. Wood elements can be painted and repainted as the whim hits you. Painting outdoors, is much easier than painting indoors - you can worry a lot less about paint dripping. Afterall, paint dripped on leaves or mulch is a pretty short term problem! The second type of "ugly" shade situation is when shallow rooted trees cause issues. Shallow rooted trees can be one element of having a dark corner (deep rooted trees also contribute to dark corners). However, shallow rooted trees are also problematic when they aren't combined with other elements to create dark corners. Some examples of shallow rooted trees are maples, ash, sweet gum, poplar, willow, American elm, beech and birch. We have already discussed limbing up of trees to improve light. If low tree branches are the main culprit for limiting light to your area, then pruning should take care of the light issue. This will leave dealing with the tree roots. Shallow rooted trees are problematic because they will compete with your plants for water and nutrition and they make planting in the soil very difficult. Digging a hole for a plant near a shallow rooted tree is an exercise in frustration and brute strength. Since light can be quite good under shallow rooted trees, your available plant list is expanded. If you have bright light, almost any shade plant should have enough light to thrive. The challenge is getting them the space, water and nutrition to do well. First, let's cover the things you can't do. You cannot install a raised bed over the roots of the tree. First of all, the roots are likely to grow into the new soil and if they don't a thick layer of new soil can smother the roots and ultimately kill the tree. You can mulch over the top of the shallow roots, however, don't put the mulch layer more than 2 to 4 inches thick. Mulching too deeply can also smother your trees roots and potentially kill it. So, where does that leave us? 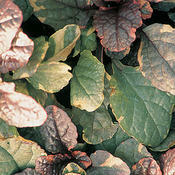 One planting strategy would be to choose one of the groundcovers from our "ugly" shade plant list above. These tough plants should be able to compete with your tree roots. Use smaller plants since they will need smaller holes for planting. Establish the groundcover under the tree. It should eventually fill in and blanket the ground. You could stop there. The groundcover will keep you from having a bare, scruffy look under the tree. However, you can easily add color under your tree by planting up containers and placing them under the tree, among the groundcover. As long as light isn't also an issue, almost any shade plant can thrive in a container under a shallow rooted tree. Using colorful pottery for the containers can add another color element. Another way to plant under a shallow rooted tree is to dig holes for larger plastic containers, be sure there are drainage holes in the pots. Place the plastic container into the hole you dug, leaving an inch or so of the top of the pot above ground. Fill this container with garden soil, liberally mixed with compost. You want a nice rich soil, but not a light weight potting mix. Potting mix will dry out too quickly. You can then plant into these containers. Because plants placed into these containers do not have to compete for moisture and nutrients with the tree, a wider array of shade plants will work. Over time, tree roots can grow up through the drainage holes of these containers and cause issues. How fast this will happen depends largely on the type of tree you are dealing with. Maples are particularly quick to grow into the pots. The ground around these containers can be planted with groundcover, as we talked about above, or covered with 2 to 4 inches of mulch. Water is going to be an issue anytime you plant under trees, this is especially true when dealing with shallow rooted trees. The groundcovers we listed at the beginning of the article probably won't need much supplemental water, once they are established. However, most plants used under trees will need extra moisture to help them thrive. This will be especially true if you plant in buried plastic containers. The containers will protect the plant in the pot from tree roots, but will also limit the reach of that plants roots. You will need to regularly water the plants in the pots to help ensure that they do not become drought stressed. Anytime you are digging in tree roots be careful not to damage too many roots and be wary of cutting large roots. Too much root damage can cause irreparable harm to the tree. You can also use the suggestions covered under the Garden Art section above, to dress up the area under a shallow rooted tree. While gardening under shallow rooted trees and in densely shaded areas is certainly challenging, there are ways to make these spaces beautiful and useful. I hope the information in this article can help you do just that. Probably one of the best articles I have read concening the shady spot. Thank you, I'm glad you found it helpful!